Buki is a locally based cinematographer and director working across the entertainment, cultural and corporate sectors. For EPiK, Buki leads on the direction and creation of our ‘Behind The Scenes’ videos, bringing a mature and unassuming presence that extracts the candid thoughts of the subject to create warm, personable and engaging human interest records of the day. She was a founding member of the BBC’s visualisation team, which enhances digital visual radio content and has a proven track record of producing high quality innovative programmes, for the youth market. 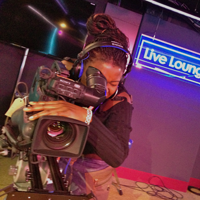 Amongst Buki’s many achievements she directed, produced and edited BBC 1Xtra’s Jamaica 50th Independence documentary, produced the visual content for Radio 1’s Sony awarding winning Hackney Academy project, as well as filming and editing Radio 1’s Live Lounge series which includes one of their most popular performances to date by Ben Howard – which has gained over 10,000,000 views and counting.